I was a very picky eater growing up. I liked things plain, didn’t want to try new things and had my mind made up about certain foods. I knew what I liked and didn’t like (supposedly). My mom always made home-cooked meals and we ate dinner together every night as a family at the kitchen table. Even if she made something I didn’t particularly care for as a child, there was always at least one thing on the table that I would eat. Even though I was picky and stubborn, one meal that I enjoyed time and time again (even at a young age) was Swiss steak. It cooked in the slow cooker for hours and the meat came out so tender, that it would fall apart as soon as you stabbed it with a fork. The sauce was simple and flavorful, and the whole combination was downright perfect. Until recently, I had totally forgotten about Swiss steak, but I was reminded last week after making a stew that had a similar flavor. Once I remembered, I couldn’t believe I hadn’t made it since I started eating meat again. With that said, I knew it had to be done. I had to make some changes, to make it legit for me, but it was pretty simple to do. I made some other tweaks too, and the recipe came out great. The flavor was pretty spot on. Combine the 1/2 tsp sea salt, coconut flour and 1/4 tsp black pepper on a large plate or shallow dish. Set aside. Melt 1 Tbsp of the butter in a large pan over medium heat. Add the onion, garlic and celery; stir. Saute a few minutes, until onion is softened. Remove from heat and pour into the bottom of the slow cooker. Place the sliced red bell pepper on top. Melt the remaining 1 Tbsp of butter in the same pan over medium heat. Dredge the round steak in the coconut flour mixture, making sure each side is well-coated. Then, place in the hot pan and brown 3-4 minutes each side. Once done, remove from heat and place on top of the vegetables in the slow cooker. Pour the tomato sauce and broth on top. Stir in the onion powder and red pepper flakes (if using), and season to taste with sea salt and pepper. Place lid on slow cooker and cook on high for 5 hours or low for 6-7. Once done, taste the sauce and adjust seasoning as needed. Serve with vegetable(s) of choice. It is SO good, Naz! 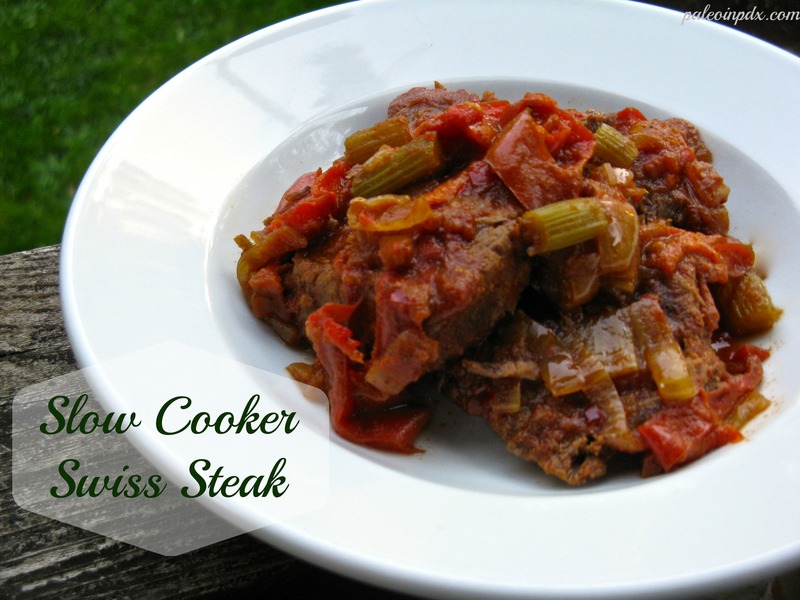 I’m not sure why it’s called Swiss steak and have a feeling it’s not actually a Swiss dish. Who knows though? I love that you all ate together every night growing up. FAMILY! That makes me smile. I know, I feel so fortunate to have that experience. There’s lots of funny memories from the dinner table over the years, including pinches under the table from my mom when we were being bad…lol! We also had rules when we were kids like no singing at the dinner table and no farting at the dinner table (yes, these things had been issues — mainly among my sisters. I was the shy one). Family is where it’s at! No singing and farting!! Ha ha. I think we should have had that rule for good old Dad!! I loved that my Dad cooked dinner every night. He is a fantastic cook! I actually don’t think he ever used a crock pot. Strange because I love mine so much! My Dad loves cooking so much that I doubt he would ever use the slower now because it would take away his nightly ritual of news, whiskey, and cooking for my Mom! Aw, what a sweet memory, Megan. Thanks for sharing! Thanks for the compliment on the Swiss Steak! Mealtime preparations were challenging some days because of everyone’s likes/dislikes but I persevered. Always felt it was important to have “family time” with dinner. I haven’t tried this with tomato sauce but I used a 15 oz. can of tomatoes. Love to you. I don’t think I’ve ever even had it!! But it looks incredible! I hope you give it a try and enjoy it, Corrie Anne!